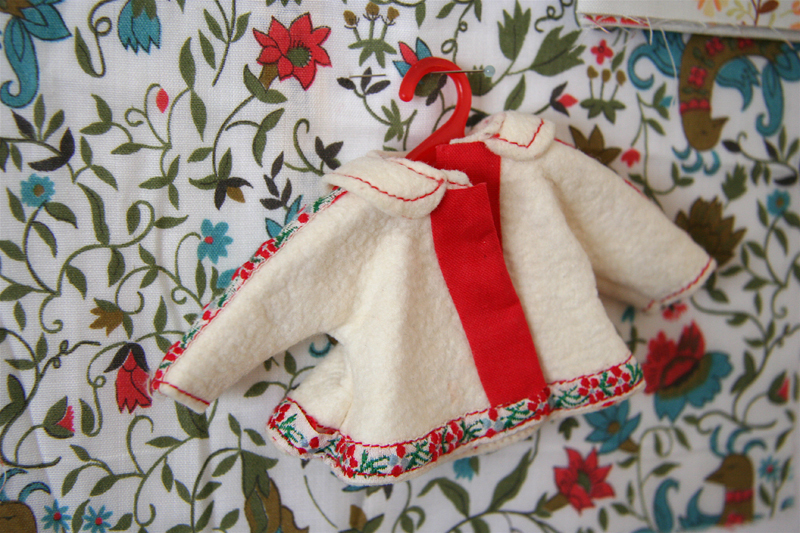 I have no time to sew this week but am doing lots of doll clothes plotting. For inspiration I went over to my Mom’s and retrieved her box of old doll stuff. I love these original outfits for her Ginny dolls. i love that last dress with the green and red/pink and white stripe. And the red cape. Very cute. I love every last one of these little frocks, but I think I like the cream sweater with the trim the best. I can’t wait to see what you come up with. i want that red coat in my size! 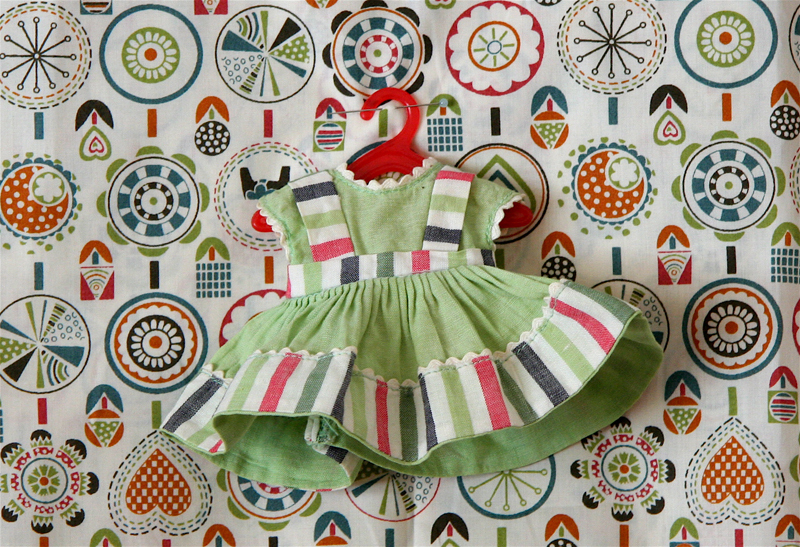 Your choice of fabric backgrounds/ inspiration look PERFECT with those cute little dresses!! 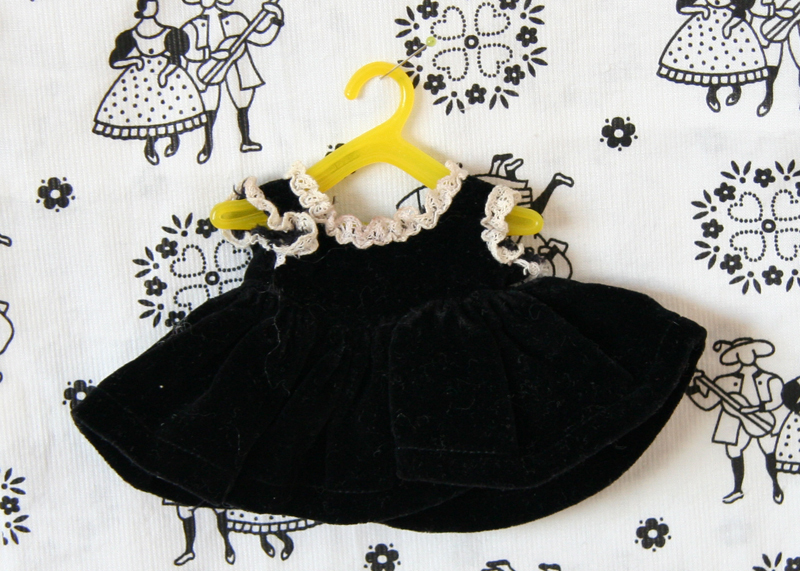 Soon you’ll be making Phoebe a dress to match her doll’s dress! Eeep, those outfits are so cute. I love the way you displayed them. 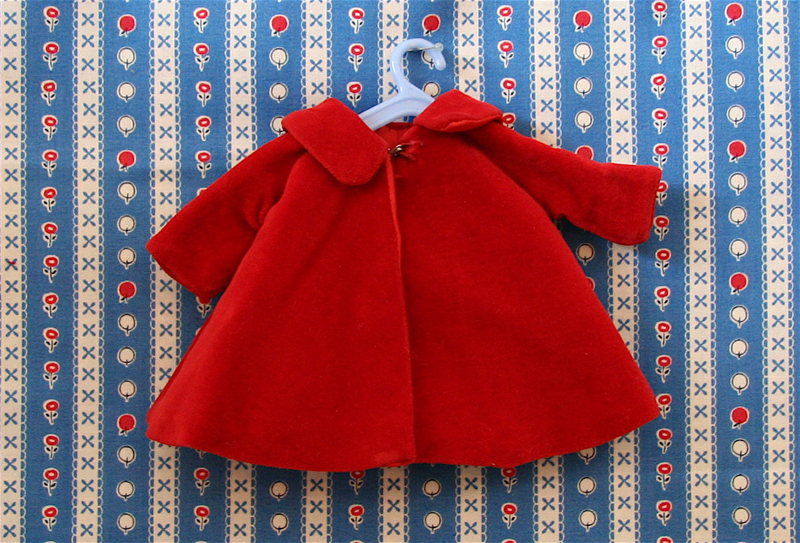 Vintage doll clothing is so fun–my favorite is vintage Skipper and I have a very similar red velvet coat from Skipper. Those outfits make the doll clothes of today (the store bought kind, at least) so ugly! I really must improve on my clothes sewing skills before my little one gets too old to want pretty doll clothes! Can’t wait to see what you come up with. Oh wow! That brings back memories! 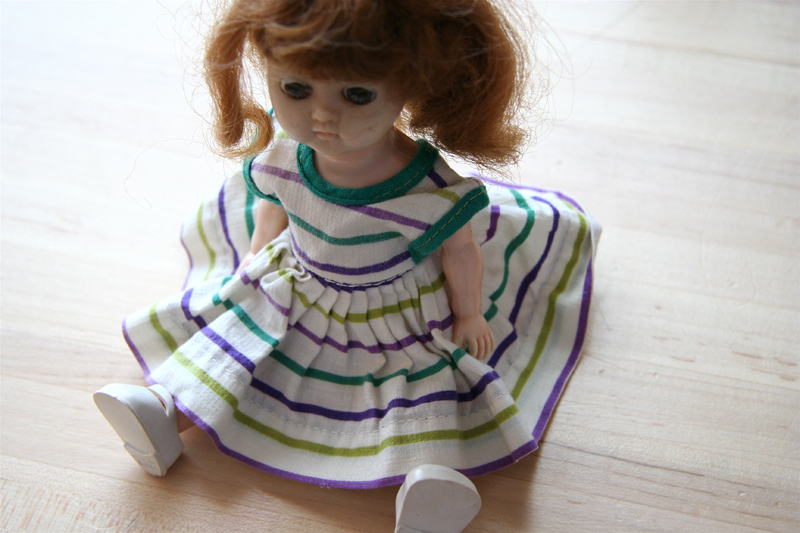 My mom used to let us play with her Ginny doll and the clothes were adorable! Wish we could get them back! I want to make those clothes kid sized for my daughter…..so cute!!! ooo! i love that lederhosen-lookin-thing! my mother and her friends got together one christmas and made outfits, sleeping bags, nightgowns for our “my friend mandy” dolls. they came with a pattern, and i think that each mom made a bunch and did an exchange. here’s a pattern link on ebay. i’d go for it for myself, but i thought you might like it. aaaack! i LOVE the combination of dresses/coats and fabric. it’s incredible how the clothes match your fabric picks so well. really lovely to look at. That little red coat is so adorable! Oh, I love it! Anything miniature is so charming, I can hardly stand it! Thanks for the fun inspiration. 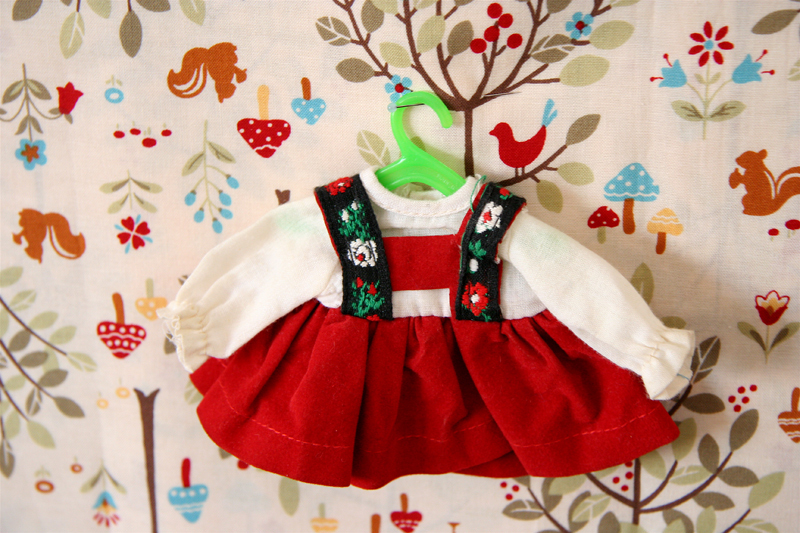 I love doll clothes and have been thinking of making some as well. BTW- I discovered that blog that you wrote about yesterday about a week ago and also fell in love with the outfits they make their girls. Ahhhhh…my mom has Betsy McCall dolls/outfits that I love to look at too (very similar to Ginny). Betsy had the cutest velvet skirts and berets. How fun. I can’t wait to see the darling creations you come up with! How adorable. It’s like a mini Octoberfest. I just ordered that japanese fabric with the squirrels last week. Can’t wait for it to come. Love all the photo’s! Those are so incredibly cute! oh my goodness…that green one with the stripes just knocked me outta my chair. FABULOUS!!! Oh, those are so cute! I especially love the red coat! so pretty, all displayed on their special background. so you come by your love of dolls from your mom. Those dolls clothes are fabulous! oh I so love ginny dolls. Mine are all packed away somewhere now, but they had many adventures in their time. I also had a ginny doll calendar at one point that had all sorts of fancy dolls and scenes. very fun. I can’t wait to see your interpretations of the costumes! Wow – you just made me flash back! I had three ginny dolls when I was little and I just loved them! They’re carefully packed away for when I have little ones! 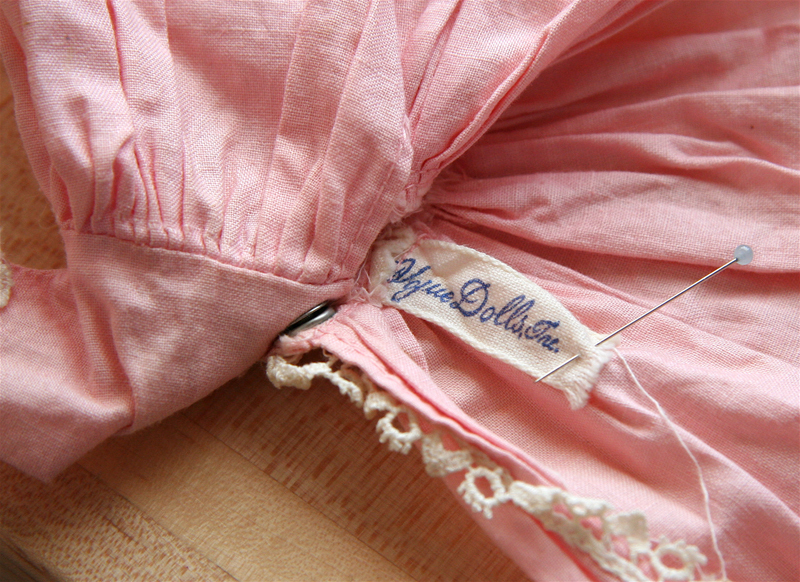 I’m going nuts with the vintage doll clothing patterns that Simplicity reissued. I think there are some that are small enough for a Ginny doll. The little red and white coat is too cute! If only they made those in big girl size! LOVE! Your choice of fabrics are to die for too – SWOON! Please, oh please, oh please tell you remember where you got the last fabric (all of the different repeative cirlcles) from AND you’re willing to share. It would be perfect for my daughter Lulu. Oh, the Ginny doll! I remember finding my mom’s in my grandma’s attic and playing with it for hours and hours… I wonder where it is now? I remember LOVING her outfits! the fabric in the last pic is liberty fabric I bought at purlsoho. They are all gorgeous but that last dress and the red coat, drool. These are just darling! I bet you will come up with some wonderful ideas from them!!! Hello! I am so loving this! Those sweet little dresses thrill my heart! I had a Cosmopolitian Ginger doll myself. My parents moved alot and I am thankful I still have her, but she is in pretty bad shape. I do still have her original skating dress ~ aqua velvet with white fur trim. Now, as an adult, my Mom has surprised me with a Ginny doll for my birthday on occasion. I want a little red coat just. like. THAT! Oh, that last one is just too much! What a fun, inspirational find. oh these photos are just lovely. You little American girls were so fortunate to have Ginny dolls. I don’t know what they look like – would it be possible to post a photo sometime? The clothes are perfect so the dolls must have been very special too. I still have my teddy but he was home-made and VERY ugly. I didn’t care, though, I dressed him myself. That’s how I learned french seams and rolled hems, age 8! How cute! My mom used to have a Ginny doll. I remember those cute little hangers and the dainty little clothes. My favorite of yours is definitely the lederhosen. I have a scottish ginny doll…. but I do play more with my blythe! (even at my age! LOL.) these clothes are just the cutest! Would love to have a red coat too! the little green dress is also divine! Yes, I am still meaning to rummage through my mom’s OLD doll clothes patterns! Hmmmmm I so have dolly (clothes) fever too! What pretty little doll clothes! I love the brightly colored fabric backgrounds. They all look so cheerful and fresh. OOOH! I love that red swing coat! Can I get one in my size? Hee, hee! *drools* I love the outfits! And the fabrics! I love Ginny dolls! That’s what I had when I was little. I had four girls, and they were by far much more fun to me than my two barbies. Great outfits!